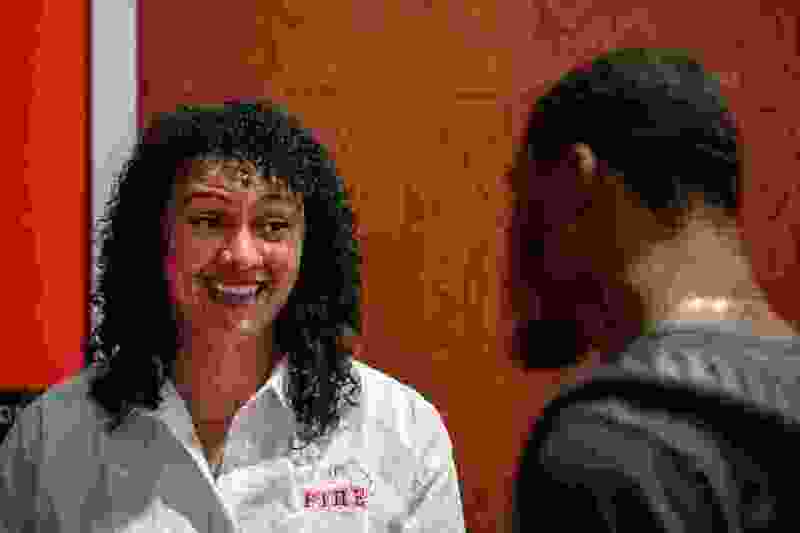 (Trent Nelson | The Salt Lake Tribune) Salt Lake City Fire Department's Darby Egbert gives information about the department to Donavan Thompson during a career networking event at the University of Utah, Wednesday, March 14, 2018. During Rockey Kalamafoni’s interview to be hired at the Salt Lake City Fire Department, the chief asked what makes him stand out from everyone else. “I don’t know about you, but looking around this department, I don’t see many brown people,” he recalled saying. He became Salt Lake City’s first Tongan firefighter. Last week, Kalamafoni bought ice cream for his stationmates to celebrate his third year with the department. (Steve Griffin | The Salt Lake Tribune) Salt Lake City Fire Department firefighter Rockey Kalamafoni at Station 13 at 2360 Parleys Way in Salt Lake City, Monday, March 19, 2018. 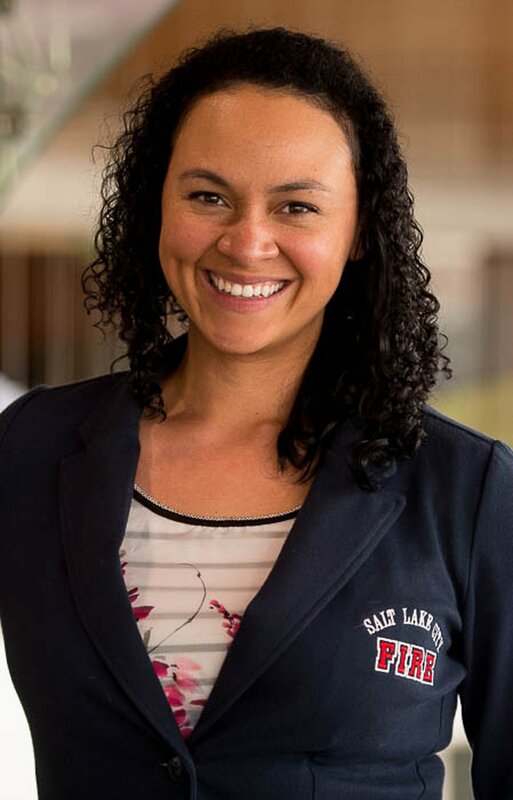 About a year later, Salt Lake City Fire Department (SLCFD) hired Darby Egbert — whose father was the department’s first black captain and battalion chief and whose mother was an Irish immigrant — as recruitment and outreach coordinator. Her job is largely to reach out to women and minorities, people from different backgrounds, states and age groups. (Trent Nelson | The Salt Lake Tribune) Darby Egbert, Salt Lake City, Thursday, Feb. 8, 2018. Of the 320 firefighters Salt Lake City employs, 287 are white men. Nationally, 88 percent of all firefighters who have been employed for 16 years or longer are white, according to the Bureau of Labor Statistics’ 2017 figures. Egbert reaches underrepresented communities through schools and cultural celebrations and parades — St. Patrick’s, Pride and Hispanic Heritage. “Now hiring” announcements for the first time were translated into Spanish and aired on Latino television networks. About 2½ years ago, the city also got rid of its citizenship requirement, which allows candidates like Musa Abdallah to apply. Abdallah, a 24-year-old refugee from Sudan, has been a wildland firefighter in northern Utah for the past three seasons but wants to join SLCFD. (Rick Egan | The Salt Lake Tribune) Musa Abdallah, a refugee from Sudan, has been working as a firefighter. Thursday, Feb. 22, 2018. He has been going to test-preparation classes that SLCFD hosts, which he said have been helpful. The department bought a version of the written test, so candidates know what to expect as far as the types of questions and the format of the exam. Egbert has seen more diversity in the test-preparation classrooms, she said. Egbert recently recruited at a networking event for student-athletes at the University of Utah — a group accustomed to teamwork and that tends to be physically capable. Kalamafoni, a former linebacker for Brigham Young University, has also gone to his alma mater to recruit, or as he calls it, “planting seeds.” He became a firefighter after deciding he wanted a career more physical than being a teacher and talking to his friend, whose father was Springville’s fire chief. As a kid, Kalamafoni didn’t see any firefighters who looked like him and he didn’t consider it as a career, even after living in Tonga for six years. He wanted to be like his uncle, a police officer for West Valley City. But he didn’t have that same relationship with the fire department. “Minorities especially don’t have that perception yet about this career,” Kalamafoni said. But when young people see firefighters from their communities, it “gives them something positive to look up to,” he said. “A lot of refugees want to get involved in fighting fires [but] don’t know how they’re going to,” Abdallah said. So he helps them, pointing them in the right direction and guiding them through the process of becoming firefighters themselves. 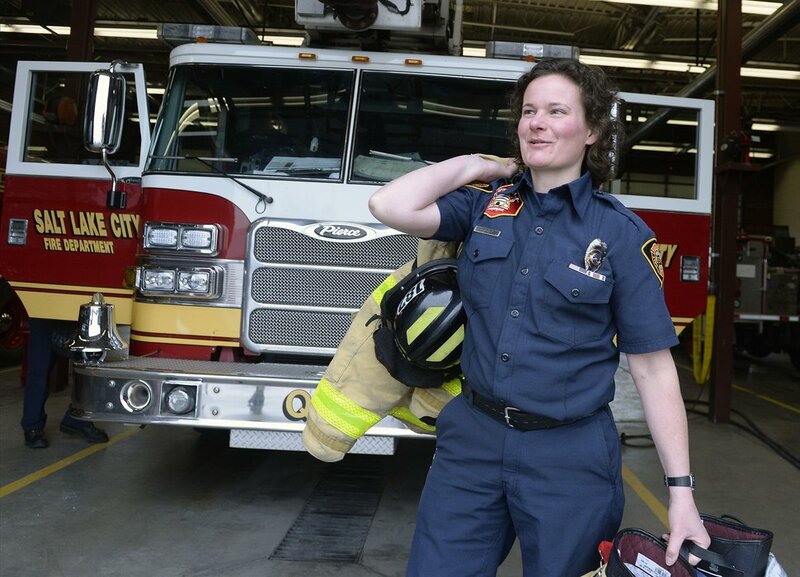 Having a connection in the fire service — a sibling or a parent — makes it easier to get familiar with the equipment and learn “trade secrets, so to speak,” said Susanna Alley, one of eight female firefighters for Salt Lake City. (Al Hartmann | The Salt Lake Tribune) Susanna Alley works for the Salt Lake City Fire Department . The department is trying to recruit in minority communities so it can hire a more diverse crew. So she brings workshops and equipment — including an obstacle course that challenges 4- and 5-year-olds to save stuffed dogs and drag hoses through tunnels — to schools, career fairs and community events. And she oversees the Salt Lake City Cadets, a program for high school-age kids interested in early training to become firefighters. The men on the crews agree there’s a “huge advantage” to having female firefighters, “because we respond to female people,” Alley said. When Abdallah came to Utah in 2013, “my English was zero,” he said. But he spoke French, Zaghawa and Arabic. Two years later, he knew English and was fighting a fire in Corinne in his first season as a wildland firefighter. The road near the fire was dangerous, so the crew set up a line to stop people from going near the flames. One man was trying to cross and didn’t understand what the firefighters were saying. So they called for Abdallah over the radio. “‘Hey Musa, can you come over here and communicate with him?’” he remembered his fellow firefighter asking. The man spoke Arabic, so Abdallah explained the situation and turned him away.